While it is true that Erma Bombeck wrote about the ordinary, mundane details and events of her life, only an extraordinary writer and person could have taken that ordinary turf and seeded it into fertile mountains of gold. By keeping her ear to the common ground—daily life and love in the realm of domesticity—Bombeck harvested an astonishing legacy as a humorist, writer, columnist, journalist, and television personality. Her hometown of Dayton, Ohio, celebrates her legacy every two years on the campus of the University of Dayton, at the writer’s conference and festival that bears her name. I was lucky; I was one of the 350 attendees from across the U.S. and Canada smart enough to register before the event sold out. In 12 hours. It takes an extraordinary woman to remain married to the same man for decades, raise three children (all of whom were present at the festival), walk the walk of feminism (she was an early supporter of the Equal Rights Amendment), write and publish, and keep her voice pure and true. No. 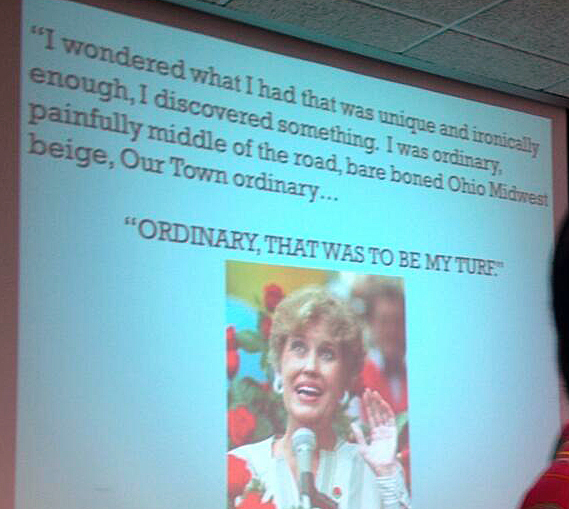 Erma Bombeck, taken from us much too soon at the age of 69, was as far from ordinary as Dubai is from Dayton. According to the Bombeck workshop website, http://www.humorwriters.org, Bombeck’s syndicated column, “At Wit’s End,” appeared in more than 900 newspapers. She wrote twelve books, nine of which were on the The New York Times’ bestseller list. She appeared regularly ABC-TV’s Good Morning America for 11 years. She was still writing her column for Universal Press Syndicate and developing a new book for Harper Collins Publishers when she died from complications of a kidney transplant on April 22, 1996. I believe Erma Bombeck deserves to be mentioned in the same breath as another Ohio-born humorist—James Thurber. When I was entering adulthood in the 1970s, I read and treasured two of her most famous books: If Life is a Bowl of Cherries, What am I Doing in the Pits? and The Grass is Always Greener over the Septic Tank. Her writing, while hilarious, also made me feel as though I were reading the work of a good friend. That was her special gift, I think. Everyone felt that they knew Erma, and at the conference, everyone did. 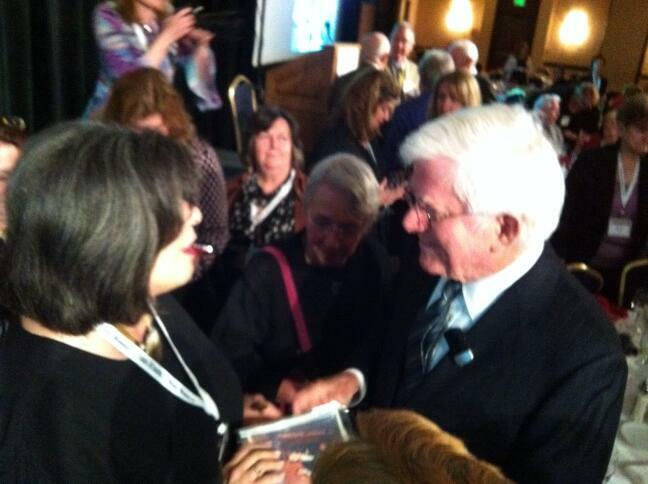 Her spirit was everywhere, most especially during Phil Donahue’s first-night keynote address. Donahue and Erma lived on the same street in the Dayton suburb of Kettering when both were just starting their careers. Bombeck, then a journalist for the Kettering-Oakwood Times, interviewed Donahue, then an announcer at radio station WHIO in Dayton. A lifelong friendship developed, and the moving eulogy that Donahue delivered at Bombeck’s funeral, which he shared with the audience, encapsulates the honesty, humor, and utter lack of pretense that was Erma Bombeck. I had an opportunity after dinner to tell Donahue that I loved what he said about Erma, and to present him with two original photographs from the days when his father-in-law, entertainer Danny Thomas, was raising funds for what would eventually become St. Jude Children’s Research Hospital. My father was a local fundraiser from Elyria, Ohio, and a huge benefit was held at a Cleveland hotel ballroom in April 1961. There’s so much more that I want to share with you about the conference—what I learned, who I saw, how I managed to navigate the campus with my knee-scooter and the help of the incredibly supportive staff at the University of Dayton—that I’ll likely have to write another post or two. For now, to keep up with all the conference news, I invite you to go on Twitter and follow hashtag #EBWW2014. You can also follow me there—here’s my handle: @midlife2wife. I’m still tweeting about the conference, so you won’t miss a thing! I’d write more now, but I have some chores to do around the house. You do know what Erma said about housework, don’t you? Housework, if done right, can kill you. So please check up on me via Twitter and here at the blog to make sure that I survived my to-do list. Lovely, Marci. And it was wonderful to see you again! I feel the same, Anne. Thank you!! Sorry you couldn’t be there…mark your calendar now for 2016! Beautifully written, Marci. What a pleasure it was to be with you. Helene, you are as lovely and gracious in real life as you are online. Thank you. It was a great pleasure for me to spend some time with you. She was special and the conference celebrates her wit, wisdom, and life. It was my first writers’ conference, did not know what to expect, and it was wonderful. Thanks so much for stopping by, and for taking the time to comment. It really was a great conference, and if it was your first-ever, you picked a wonderful one!